Back when I was competing, the world of athletics was different in many ways. But at the core, it’s still the same. As an athlete you want to win; you want to achieve the goals you set. You work very hard at your craft and you simply want to be the best. That, in my opinion, has never changed, and in all honesty, I don’t believe it ever will. So what are some of the differences between how it was then and how it is now? To start, in my day we had limited resources. There were a lot of things you had to do on your own. You could not get a massage every day. You didn’t have access to the chiropractic, sport medicine and sports psychology support we see today. Instead, you did more basic modalities like ice baths and stretching on your own. You had to find creative ways to stay healthy and injury free. With limited resources available in Canada, you did what you had to do to be successful. If you wanted to make it in the sport, you had to go south of the border. For the most part, athletes relied on foreign coaching and relocated to where they had access to better training facilities. At the time, those resources were primarily available in the United States. NCAA coaching still plays a big role today, but now our athletes have options, one of which is to remain at home. In some areas, Canada can be a competitive option for our athletes. In my case, I spent a good part of my career training in the U.S., because there were no indoor training facilities in Ottawa, and quite frankly, it was too cold. Once the winter weather hit, I had to do like the birds and migrate south. I needed the warmer environments to maintain my training schedule. I would say that when I was an athlete, there was less communication from coaches in terms of technical feedback following practice sessions. Your coach would provide guidance on the track but very little follow up. You had to figure out the next steps on your own. In essence, as the athlete, you were invested in the performance outcome and had to do everything necessary to get to the next level. I bought my own camcorder, videoed my training session and reviewed my own film. I reviewed the technical cues that were given to me in the day’s session, and from there, “self-corrected” or found areas I needed to improve. Today, our athletes are surrounded by a team of professional practitioners, who are there to assist them in achieving world-class performances. Everyone is invested in the success of the athlete and coach. The system, as we know it now, is coach-lead, athlete-centred. In today’s coaching model there is a great deal of communication between the athletes and the personal coaches, and the personal coaches and the practitioners. As a coach, I use any and all tools at my disposal to make sure athletes understand how to become better. There is a stronger emphasis on science today. There was less of that in my day. I am not saying it didn’t exist, but my coach did not stress that aspect of training. Today, we have a greater understanding of the benefits of incorporating science into the daily training environment and the overall athlete program. We use the science to predict performance at the highest level. For example, if we look at the evolution of our sprint relay program, we have used a lot of data analysis and GPS monitoring of our sprinters to try to get ahead of some of other relay teams in the world. We’ve provided scientific information to the athletes so they can perform better against the competition. We are using more innovation now. We are constantly looking for ways to get better, to shave time off past performances. We’re bringing our athletes together more often to further expose them to enhanced skill training and state-of-the-art technology. We’re constantly looking for ways to bridge the gap between where we are and where the rest of the world is. It’s great to see how the art and science of coaching has grown. Today we see more coaches relying on the science and more importantly, we see athletes showing an interest in what the data is indicating. Athletes understand the value it brings and they understand how to use it to make themselves better. The science has evolved and the athletics community has evolved along with it. 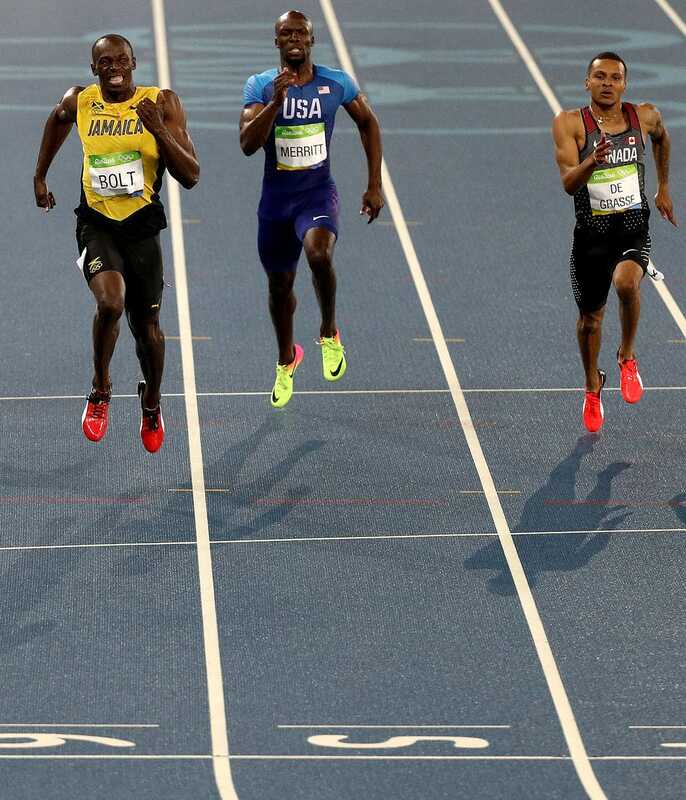 Athletes have become more involved with how science impacts track and field. (Canadian Press). The pressure to succeed is different today than it was for my era. It’s much harder for an athlete to compete on a global scale; the level of the sport has elevated. Qualifying for major championships has become increasingly more difficult. Athletes are getting better worldwide and standards are rising. It has become more difficult for athletes to make semifinals and finals at major events. This in turn has influenced performance accountability. When I was running, performance was important to me and to my personal coach, but performance did not carry the weight it does now. An athlete’s funding is directly tied to performance today. Whether it’s a shoe sponsor or government funding, it is all tied to performance. Athletes and coaches have a very good understanding of what is needed. They know that the system invests in future performance, not past results. Regardless the era, one thing is for certain in athletics: longevity is the desired effect. To have a long and prosperous career as an athlete or coach, you must be willing to measure yourself against the best in the world. You have to be innovative in your coaching in order to see athletes deliver high-performance results on demand. Ultimately, in our sport, folks are only paying attention every four years. And every four years it is our opportunity to demonstrate why track and field is the best sport in the world. Q: The best book you've ever read? A: The Last Lecture by Randy Pausch. A: Anything by Joe Rogan. Q: Best advice you ever received? Q: What word or phrase do you overuse? Q: What is a skill you wish you had? Q: What's something no one would guess about you? A: That I make amazing shortbread cookies. Q: If you could have the ultimate influential dinner party, who are the six people you'd invite? A: Nelson Mandela, Barack Obama, Mother Theresa, Tom Jones, Malcom X, Michael Jordan. Q: What makes you cry, every time?